Fanquip has developed a new fan technology – complete with safety monitoring system – specifically for use when handling asbestos and other substances that are harmful when airborne. 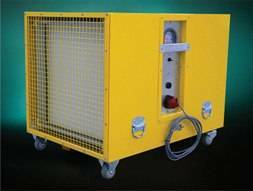 Designed and manufactured in Australia, the Fanquip Negative Air Fan is for applications where contaminated airborne particles must be removed to create a clean/safe working environment. It is the first air fan of it’s kind, designed as mobile air purifiers for homes with the power and capability to remove industrial pollutants. It is revolutionary in home renovation and construction domain. These fans have a ‘dust load monitoring system’ and have been developed in response to strong calls from professionals holding specific licences for removal of product likely to cause harmful or toxic conditions when being handled. Considering trades people need specific training and licences to handle potentially carcinogenic product, Fanquip saw the need for a specific fan technology to keep workers safe during their jobs. The Fanquip Neg Air Unit is configured with a HEPA filter, tested to AS 1324 to achieve minimum efficiency of 99.99%.This unit is fitted with a failsafe dust load monitoring system which notifies the operator when the filter is dirty. It does so by means of two-stage alarm and flashing light. First stage alarm is activated when the filter system is reaching a stage where its replacement is required. Stage Two alarm warns at the critical stage once the filter has dropped below its rated capacity, when the alarm sounds again and the unit will be immobilised for total workplace safety. The Negative Air Filter Fan operates on a 240 volt, 10 amp, and 3-pin plug electrical system. Manufactured to handle the toughest of environments such as building and construction sites, quarries, dilapidated old asbestos-roofed warehouses and sites undergoing toxic remediation.